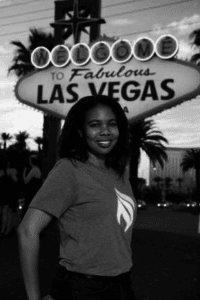 Longtime #VegasTech community member and leader Shavonnah Tièra Collins will lead efforts to ignite change, incubate ideas, and build community and industry engagement at RedFlint experience center. The center is expected to open in downtown Las Vegas in October 2016. University of Phoenix’s first-of-its kind innovation center in Las Vegas will provide visitors with an experiential, hands-on learning environment to help them innovate in their companies and in their own careers. The RedFlint experience center will also host Iron Yard Ventures, which provides selected startup businesses access to one of the premier business accelerators. Collins, an educator and entrepreneur who is highly engaged in the Las Vegas business community, will lead efforts to build engagement and spur innovation within the Las Vegas business, education, and government communities. Prior to joining RedFlint, Collins was an instructor at University of Nevada Las Vegas where she continues to be an adjunct instructor. She also served as Las Vegas Metro Chamber of Commerce foundation director of Entrepreneurship & Vegas Young Professionals. That’s great news.. congratulations Shavonnah :).. very exciting for our entrepreneurial ecosystem. I’m so excited to keep propelling the momentum of #VegasTech. We can’t wait to have everyone in the space. This is great! UoPx is making this almuni a VERY PROUD Phoenix! Make sure to come down in your Phoenix Red socks Kirk. Upward and onward! I hope to stop in and see you there after the Nov 8th election.